Now that my pregnancy is winding down, I’ve come up with 10 things that have really made the whole process a lot more comfortable. Of course, there’s the basic things you’d think of—prenatal vitamins, lots of fruit (I’ve never craved it so much! ), and all of those pregnancy books & apps (I use Nurture and have loved it. Plus, the forum on there can be pretty entertaining!). Here are 10 things that I swear by that maybe aren’t so generic and obvious. 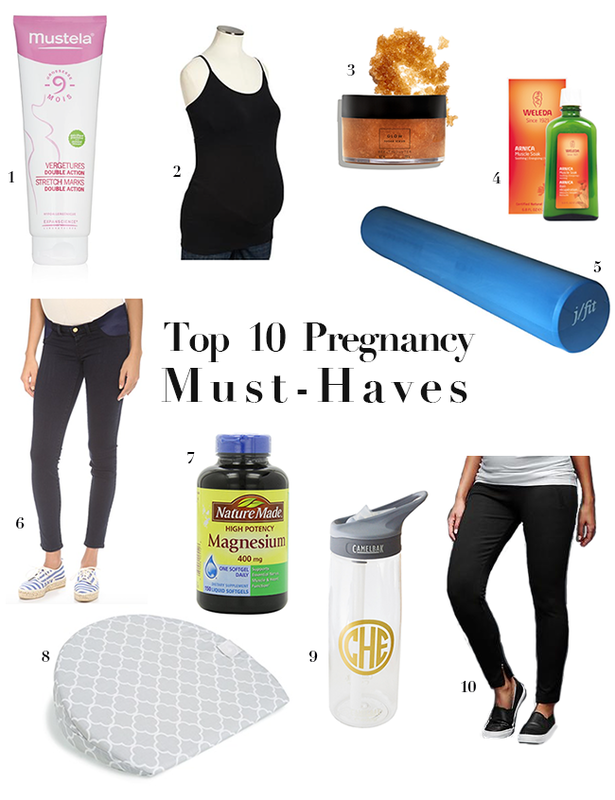 And to all of you mommas, what are your biggest pregnancy must haves? This is a top-rated stretch mark cream and so although it was pricey and the bottle seemed small, I decided to bite the bullet. I heard it would last a long time and it has. Even after a good 3-4 months of daily use, there’s still plenty more to go. I only apply it at night, though the directions say to use it in the morning too. When I wake up, I can still feel how smooth and hydrated my skin is! It’s different than a regular lotion or body butter. It really coats the skin and makes it feel strong and hydrated more than anything else. I’ll continue using it until a couple months after W is born, at least. My skin is prone to scarring and stretch marks, but so far so good!! They aren’t anything overly special, but they’re less than $10 and they’re long and soft. I have this tank in black and white—and I layer them under sweaters and blouses all the time just to make sure my bump stays covered! I don’t own any maternity blouses and these tanks practically gives any of my regular tops maternity coverage. When I say my skin has been dry during pregnancy, what I mean is it is similar to the Sahara Desert. Mainly just my legs. They get so flaky! I have never, ever experienced anything like this! A good scrub like this has been a lifesaver for me. This one smells amazing, performs better than almost any other I’ve tried, and it’s made of all safe, nontoxic ingredients. When I exfoliate my skin, then lay in the tub with the muscle soak below … money. While long, hot baths aren’t recommended during pregnancy, it’s a really nice treat to soothe tired joints and muscles. And just to relax, too. This muscle soak has a great, fresh scent and is made with all natural ingredients. It also has a warming effect. My back aches have been just the same as before pregnancy. Easy aches where I would just twist my body and get relief. But here’s the catch, I can’t twist my body safely in the same way to relieve those back aches! Plus, it’s common for pregnant women to have extra pressure in their hips and lower back. I have that, too. Enter: foam roller. Your new best friend. I lay this baby down on the ground and put my back on it right where I have pain. Just rolling it out relieves so much pressure. Here’s a great video showing foam rolling techniques during pregnancy. Everyone is different, but for me, I can’t do the belly panel. The feeling of having constricting fabric on my belly makes me feel suffocated or something! I think this all started when I was three years old in ballet and refused to wear a tutu because I didn’t like the extra fabric being bunched up on my skin. These jeans have been worn constantly through my entire pregnancy and they’ve grown with me every step of the way ( I bought them in my normal size). I got every single one of those 211 bucks worth out of them, I promise you. My advice? Just buy one pair of maternity jeans like this and wear them every moment you possibly can. People won’t know you wear the same ones all the time, but they will look good through lots of wear and not lose their shape like cheaper pairs—and they’ll hug you in all the right places. This was my best pregnancy investment. Shopbop is having an “up to 25% off” promo right now and that’s where I bought mine, but there’s only one size left. Here they are in a similar color, though! All that said, though… my mom found some white maternity panel jeans for me on clearance at Target and I’ve been wearing them like crazy since the weather has warmed up. They don’t keep their shape as well as the J. Brand one, but for a clearance pair and white? They are great! I just put the panel down under my belly mid-way through they day when it starts to irritate me. I am obviously not a doctor, so please be sure to ask yours before popping these pills, but my doctor approves and actually recommended it during pregnancy. Magnesium helps build strong bones. It regulates blood sugar. It relaxes your muscles and helps your blood to clot appropriately. It’s supposed to help if you suffer from tension/stress. It helps you sleep better. It’s said to help your baby receive better nutrition through the placenta. And this part is huge: it keeps your digestion regular by relaxing the digestive tract and neutralizing stomach acid. I went about a week without magnesium a couple months ago when I forgot to repurchase… Let’s just say, the part about keeping your digestion regular is TRUE. My stomach felt miserable until I got back on magnesium. Here’s some more information if you’re wanting to read more about it. For $16, this is a no brainer. My friend gave this to me early on in my pregnancy and I’ve gotten so much use out of it. It’s nice to prop under my belly for support when laying on my side. I put it under my head to prop it up when I have acid reflux. You can also put it in between your knees when laying on your side, too. I even use it as a laptop pillow! Sounds silly, but it works when I place it on my legs with the thinner part of the wedge facing my belly. It makes the perfect flat tabletop! Never in my life have I been so thirsty as I have been while pregnant. And I can definitely feel the effects when I’m dehydrated, so I’ve made it a point to keep a water in my hand at almost all times. Since I’ve never in my life been a huge water drinker during the day, I had to make this easy on myself by keeping water bottles ready to go in the fridge. When I do that, I can’t make an excuse for not making myself a cup of water (even though I realize this sounds so simple and mindless). Having the water ready to go in the fridge gives you no excuse to grab one, even when in a rush to get out the door. I love my monogram Camelback from White Elephant Designs. I’m calling them legging pants because Gap calls them pants and I say they are leggings. Either way, they are amazing and you need them. Mine are a little different (they don’t have the zippers on the bottom like these), but the material and style is identical. They are so great because the material is thick and they support you like pants, but they are soft and stretchy like leggings. I took a small in them, for reference. Girl, we need to get you on Beautycounter skincare! It saved my skin. My body is loving the gentle ingredients. I always tried to "attack" my face with all of these chemicals (which are toxic, come to find out), but when I switched to the safe, gentle chemicals that Beautycounter uses in their system, my face was like "THANK YOUUU!!! We can tolerate this!" Highly recommend the Essentials line. I use it morning and night. Love your blog and so excited to see your journey into mommyhood, hopefully one of these days I'll run into you around Charleston! Do you take the magnesium pills on top of the regular prenatals? Muscle soreness, tension, sleep problems, digestion… all major problems for me right now. I need any help I can get. This pregnancy thing is not a breeze. Yep, I take them on top of regular prenatals because the brand I use (NatureMade Prenatal Multi + DHA) does not have any magnesium in it already. Ask your doc at your next appointment, but I really do recommend them. I am telling you, the week I didn't have my magnesium pills was not a good week! Great tips, I can vouch for the magnesium! I take Natural Calm every night and it helps me relax and keep things moving. It's a part of my night time routine that I don't think I can live without now! I will post a link if you want to check it out! Totally agree with you on the "good jean" investment! I got a pair of Paige maternity jeans – no panel, just sit under the belly and have adjustable waist if needed. I loved them and wore them a lot. And they were still in great shape for baby number 2. Great info… Its important to use a moisturizer to hydrate the skin on your belly, sides, lower back, thighs, legs, and anywhere else you might get stretch marks. Regular lotion won't penetrate the skin deeply enough to keep it hydrated, so use a product specifically made for pregnant women, or choose a natural oil. During and after pregnancy it is crucial to use safe and natural stretch mark cream, which will not pose a negative effect on your body. You suggested very important tips. My sister is pregnant and your blog will really helpful for her. I will diffidently share this blog with her. Thanks a lot for sharing.